Environmental Stewardship is recognized as one of the primary responsibilities of the Canal Corporation (Corporation). Incorporating Environmental Stewardship into all projects and activities is one of the Strategic Goals of the organization. Successful implementation of this goal requires that all Corporation employees take on the role of environmental stewards. Each year the Canal Corporation conducts dredging in order to maintain minimum water depths for navigation in the Cayuga-Seneca, Champlain, Erie and Oswego Canals. (Dredging in the Champlain Canal is currently limited to the confluence of the Hoosic River and Hudson River). Four floating plants, staffed with permanent and seasonal employees, are located on the Canal in Waterford, Utica, Syracuse and Albion. Each floating plant has the capability to dredge by hydraulic and mechanical methods. Most dredging is conducted during the navigation season between May and November. The average yearly volume of sediment dredged is approximately 280,000 cubic yards. Hydraulic dredging involves the pumping of sediments from the water into upland sites where solids are settled out before the water is returned to the Canal. Turbidity (a measure of the “cloudiness” of water) in the water being returned to the canal is monitored every few hours to ensure the waterway is not adversely impacted by the dredging operations. Highly turbid water can adversely impact fish, wildlife, and sensitive environmental habitats. Mechanical dredge sites normally consist of coarse grained sediments. These sites are dredged through the use of clamshells, backhoes, and Gradalls. Sediment is excavated and placed into barges for transport to the upland disposal site. The Canal Corporation uses a hydraulic off-loader which pumps the sediment directly from the barge into the upland site. Dredging at stream mouths is avoided or limited during fish spawning season every May and Junefrom April through June. This precaution ensures that these special areas and any fish seeking to spawn in the creeks are not adversely impacted. 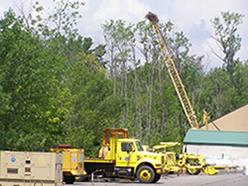 In recent years, the Canal Corporation has expanded its use of “dry dredging.” Dry dredging involves the use of traditional construction equipment to remove sediment during the non-navigation season when water levels are lowered. This practice largely takes place out of the water and as a result, protects the water quality and minimizes any adverse impacts on environmental habitats. Since 1982 more than $3 million has been spent to control the growth of water chestnuts (Trapa natans) in Lake Champlain. The water chestnut is an aggressive aquatic plant that is native to Europe and Asia and was introduced to New York State in the late 1800s. The water chestnut infestation spread rapidly northward in the Hudson River Basin and into the southern end of Lake Champlain. The continued northward advance of the infestation prompted a renewed control effort by both the New York State Department of Environmental Conservation (NYSDEC) and the State of Vermont Department of Environmental Conservation (VTDEC) in the early 1990s on Lake Champlain. In 2011, Hydrilla verticillata was found in Cayuga Inlet and Cascadilla Creek in Ithaca, Tompkins County. The Canal Corporation actively participated in the rapid response team that mobilized to address this emergent threat. Stormwater runoff gathers a variety of pollutants, which degrade New York's lakes, rivers, wetland and other waterways. Stormwater management, especially in urban areas, is becoming a necessary step to reduce pollution in New York's waterways. A new federal regulation, commonly known as Stormwater Phase II, requires permits for stormwater discharges from Municipal Separate Storm Sewer Systems (MS4s) in urbanized areas (population of 1000 per square mile or more) and for all construction activities disturbing one or more acres. To implement the law, the New York State Department of Environmental Conservation has issued two general permits, one for MS4s in urbanized areas and one for stormwater management at construction activities. The New York State Canal Corporation (Corporation) has had coverage under the MS4 permit since March 5, 2003. Working in conjunction with our consultant engineers, the Corporation is implementing a stormwater management program (SWMP) for compliance with the federal and state Stormwater Phase II program. In response to the 1987 Amendments to the Clean Water Act, the U.S. Environmental Protection Agency (EPA) developed the National Pollution Discharge Elimination System (NPDES) Stormwater Program. NPDES addresses sources of stormwater runoff that have the greatest potential to negatively impact water quality including small, medium and large municipal separate storm sewer systems (MS4s) and construction activities that disturb more than one acre of land. These regulations apply to municipalities, as well as to all public entities that own and maintain a separate storm sewer system. To comply with NPDES requirements, NYSDEC issued a general permit for stormwater discharges from MS4s (GP 0-15-003) and for stormwater discharges from construction activities (GP 0-15-003). A SWPPP is a plan that describes the strategies and steps that will be taken to prevent nonpoint source pollution discharging from a construction site. All capital and maintenance projects that disturb one acre of land or more require the Corporation to develop SWPPP. The SWPPP is the backbone of the construction process as it relates to erosion and sediment control, and stormwater management, both during construction and post construction. The SWPPP includes a description of all construction activity, temporary and permanent erosion and sediment control Best Management Practices, permanent stormwater management, and other pollution prevention techniques to be implemented throughout the life of the construction project. The SWPPP includes a combination of narrative plans and standard detail sheets that address the foreseeable conditions at any stage of construction. These plans are required by the New York State Department of Conservation as part of their SPDES permit to comply with NPDES. Stormwater runoff gathers a variety of pollutants, which degrade lakes, rivers, wetlands and other waterways. As a result, stormwater management, especially in urban areas, is becoming a necessary step to reduce pollution in New York's waterways. Federal regulations require permits for stormwater discharges from Municipal Separate Storm Sewer Systems (MS4s) in urbanized areas; as such, MS4s are required to develop a Stormwater Management Program (SWMP). To comply, New York State Department of Environmental Conservation issued a general permit (GP 0-15-003), which became effective on May 1, 2015, and will continue for two years through April 30, 2017. Under this Federal regulation, the Corporation is considered a regulated non-traditional MS4. The Corporation recognizes the importance of environmental stewardship and has taken a proactive approach to pollution prevention. In support of these efforts, the Corporation developed and implemented a statewide stormwater management program, the framework of which was submitted to the New York State Department of Environmental Conservation (NYSDEC) in March 2003 for compliance with the State's General Permit. The Corporation continues to evaluate facilities and operations, develop standard operating procedures and best management practices for high-risk activities. What's Being Done To Protect And Promote Clean Water? 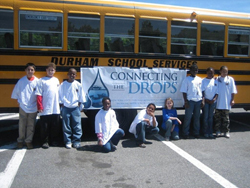 Public Outreach – The Corporation developed a public participation and education campaign called "Connecting the Drops." The stormwater slogan and logo have been incorporated into the Corporation's educational brochures, posters, website, and other stormwater and environmental material. The "Connecting the Drops" campaign includes collaboration with various agencies to educate the public about pollution prevention and provide information about the Corporation's stormwater management program and other environmental stewardship initiatives. Canal Directives – Established Corporation Canal Directives (CDs) prohibit illicit discharges that could occur within the Corporation MS4 as a result of maintenance and operation activities. The Corporation's Environmental staff visit and evaluate Corporation operations for environmental compliance and perform an annual State Agency Environmental Audit. If an illicit discharge occurs at a Corporation facility, the problem is corrected and follow-up actions are implemented. For illicit discharges found off the Corporation's right-of-way, the Corporation notifies the appropriate agency. Stormwater Outfall Mapping and Inspections – The Corporation inspects all stormwater outfalls within the canal right-of-way that are in the NYSDEC designated urbanized areas. Inspections are performed at all Corporation facilities that have the potential to pollute stormwater based on the equipment located on the site or the operations that are performed there. Outfalls along the canal are surveyed, inspected, and mapped in GIS. The Corporation also inspects large diameter culverts for hydraulic and structural condition and has incorporated stormwater inspections into their program. The Corporation 's environmental staff revisits all outfalls that show some evidence of an illicit discharge and will implement appropriate remedial actions if an illicit discharge is determined to exist. Employee Education and Training – As part of the MS4 program, extensive Statewide stormwater management training was provided to Corporation employees involved with the design, construction, and maintenance of facilities. General awareness training was conducted by the Environmental Services Bureau, for more than 200 employees in all Corporation Sections, including managers, supervisors, engineers, and technicians. More detailed training on the permit requirements and how they affect operations was provided for approximately 130 designers, environmental specialists, managers, supervisors, and maintenance managers. In addition, training on the requirements of the new General Permit was provided to educate Corporation employees, and Post Construction Stormwater Control training was conducted to educate staff on the inspection and maintenance of permanent stormwater controls. Training programs are conducted on an annual basis for Corporation employees. Facility Evaluation and Prioritization – Corporation facilities, including storage areas and maintenance facilities, have been evaluated to ensure the new stormwater permit requirements were fully integrated into the Corporation 's BMPs. A representative sample of these facilities was visited across the State to review operations and assess the potential environmental impacts that such activities may have on the stormwater discharges. Operations that were evaluated included pesticide storage and application, vehicle maintenance, right-of-way mowing, fueling operations, chemical and petroleum storage, and material storage. BMPs were developed to assist in protecting clean waters. Facilities were also evaluated based on their potential to discharge a contaminant of concern to an impaired waterbody. Evaluations included 303(d) impaired waterbodies and those facilities that discharge to a Total Maximum Daily Load watershed. BMPs and Standard Operating Procedures have been developed to continue to protect these waters. Review and Update Existing Policies and Procedures – The Corporation continually reviews existing control mechanisms to clearly define the roles and responsibilities of involved parties with regard to the protection of stormwater quality and adequate training and oversight. The initial review and modification of existing control mechanisms has been completed, however this will be an ongoing process as the Permit evolves and control mechanisms are improved upon. Stormwater Management Program Plan - The Corporation developed a Stormwater Management Program (SWMP) Plan, which includes detailed written explanations of all management practices, activities and other techniques, to document developed, planned, and implemented stormwater management elements. Describes the Connecting the Drops campaign and the importance of keeping pollution out of the watershed. Outlines proper vessel operation and maintenance practices that will help keep the Canal System clean and informs people how to identify and report illegal discharges and dumping observed while cruising the Canal System. Describes how stormwater can become polluted and provides an overview of practical ways homeowners, drivers, boaters and pet owners can prevent pollution from entering the watershed. Describes the harmful effects of discharging the pollutants phosphorus and nitrogen to the waterways and provides suggestions for nutrient pollution prevention. These posters outline proper operating proper operating procedures for Canal maintenance facilities that will help Corporation staff to reduce the risk of stormwater pollution. This poster provides guidance to Corporation staff on the proper operation and maintenance of oil water separators at Canal maintenance facilities. Children’s coloring book and activity guide for children grade K-6. Word Scramble, word search and coloring pages help teach kids how to keep water clean. A fun and informational fact sheet aimed at students grade 3-6 to educate them about the things that we all can do to prevent stormwater pollution from entering waterways. As part of the Corporation’s SWMPs, annual reports are developed to summarize activities completed each year. The entire New York State Canal System is a “no discharge zone.” Boats are banned from discharging sewage into the canals and must instead dispose of sewage at specially designated pump-out stations. Discharges of sewage from boats can contain harmful levels of pathogens and chemicals such as formaldehyde, phenols, and chlorine, which have a negative impact on water quality, pose a risk to people’s health, and impair marine life. View more information on marine sanitation devices and pump out stations . While General Electric (GE) has completed a multi-year project of remedial dredging (some habitat restoration work is ongoing) in the Hudson River, GE's project focused on environmental dredging and not navigational dredging and provided limited improvement of the waterway for navigational purposes. 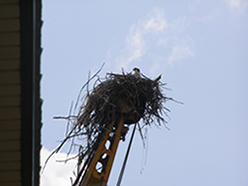 The Corporation recently identified a pair of ospreys nesting on top of an out-of-service mobile crane at the Corporation's Lysander maintenance yard. 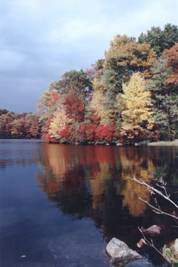 The Lysander facility is located beside the Oswego River and surrounded by wetlands on three sides. Once established, osprey nests are often used year after year. 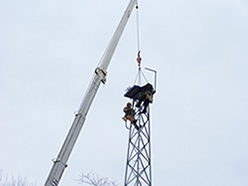 Therefore, to help ensure a viable future osprey population, the Corporation, in cooperation with the New York State Department of Environmental Conservation (NYSDEC), relocated the nest to a nearby abandoned inoperable radio tower retrofitted with a platform. The Corporation considers the ospreys an asset and intends to maintain a safe environment for their nest.